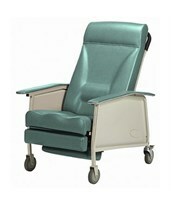 Our Clinical Recliners can be used for home care as well as hospitals and nursing care facilities for the comfort of your patient. 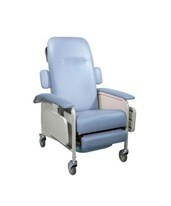 They are especially suited for dialysis, blood collection, extended care, emergency room and oncology use. The Clinical Recliners have extremely comfortable and supportive backs and seats and are designed for easy cleaning and maneuverability. They come with various reclining positions and their own unique features. Browse our selection below and contact our sales staff if you require any assistance. 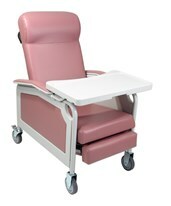 Mobile Positioning Chairs are designed to meet the needs of patients who require specific, long term support and positioning. 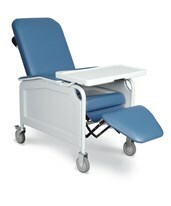 See Invacare's Mobile Positioning Chair with Tilt & Recline - Deluxe which features an elevating leg rest, arms that can be adjusted for height, a back that folds down, and a lap tray. It has a weight capacity of 250 lbs. You can choose between two widths and three colors for the chair. 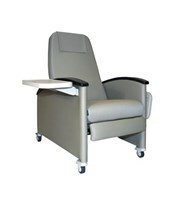 Geri Chairs provide comfort and better quality of life for patients who may need more support than a wheelchair can provide. 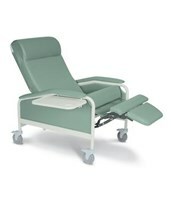 The Reclining Geri Chair with Elevated Leg and Footrest from MJM has three reclining positions and comes with various sizes and in a large selection of color choices. 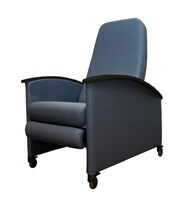 Check out the 3 Position Geriatric Recliner - Deluxe Adult from Invacare. It has removable sides for easy cleaning and a removable table for great convenience. 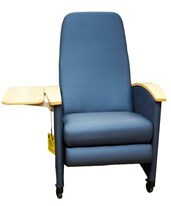 This section also includes accessories and attachments for the chairs, including trays and a Lap Security Bar. 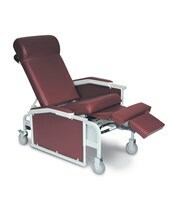 Trendelenburg Chairs easily allow the legs to be elevated higher than the heart to help with clinical care. 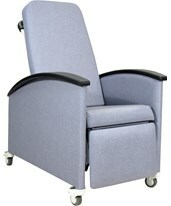 Check out Drive's Four Position Clinical Care Recliner with sides that come off easily for easy cleaning and 5" casters for easy portability and positioning. 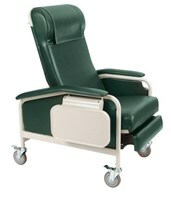 The Swing Away Arm Trendelenburg CareCliner from Winco has four reclining positions and has options of adding a heat and massage feature, IV pole attachment, and leg extensions. 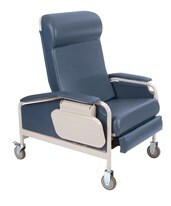 The XL Nocturnal Elite Trendelenburg CareCliner features Liquicell pads for both comfort and clinical assistance, and two foot releases for the attendant. Click on the product to see the rest of its fantastic features. 3 275 lbs. 21.5" 19" 46"
3 275 lbs. Lifetime 20.5" 19.5" 46"
3 400 lbs 3 Year 32" 22.75" 47"
4 250 lbs Lifetime Warranty 22.5" 21.5" 47.5"
3 275 lbs. 18.5" / 19.5" 19" / 19.5" 45"
3 350 lbs. 19.5" 22" 47"
3 275 lbs. Lifetime 19" / 20" 19" / 19.5" 46.5"
3 450 lbs. Lifetime 23" 25" 49"
3 450 lbs. Lifetime 20.5" 24" 47"
4 275 lbs Lifetime 21" 21" 49"
4 450 lbs Lifetime 21" 25" 49"
4 350 lbs Lifetime 20.5" 22" 47"